Kéyner Segura is an architect and graduate of the School of Architecture of the University of Costa Rica with Graduate's grade. He received courses of History of Architecture and Art, and also received composition lessons and its forms on behalf of the architect and Chilean plastic artist. Juan Bernal Ponce. He studied drawing and perspective in the Spanish architect’s shops Nicolás Belcic. Segura presents us a work loaded with symbolism, unthinkable beings and stylized forms. Absolute geometric order in some pieces and total freedom in the way in other, their work takes charge of transporting us to a world that only exists in the artist's imagination. The learned colors of the landscape in their native Guanacaste, are supplemented to make possible singular spaces and unique situations in each one of their works. 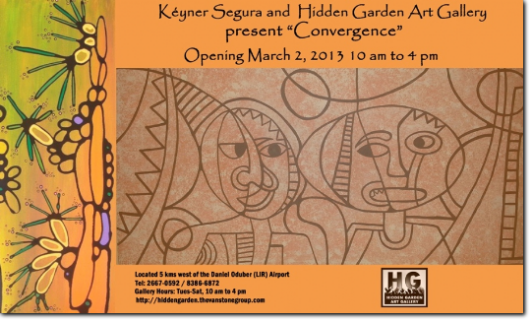 Kéyner Segura resides in Guanacaste, which day by day feeds his creativity and imagination. In his newest show, "Convergence," Kéyner exhibits the points of convergence of different styles and techniques explored in the past few years. With a dynamic and communicative approach in a unique style, he paints freely soaring from one style to another, exploring them all according to his artistic needs. Read about Kéyner Segura in A.M. Costa Rica and the Tico Times. View the slide show of "Convergence," here.